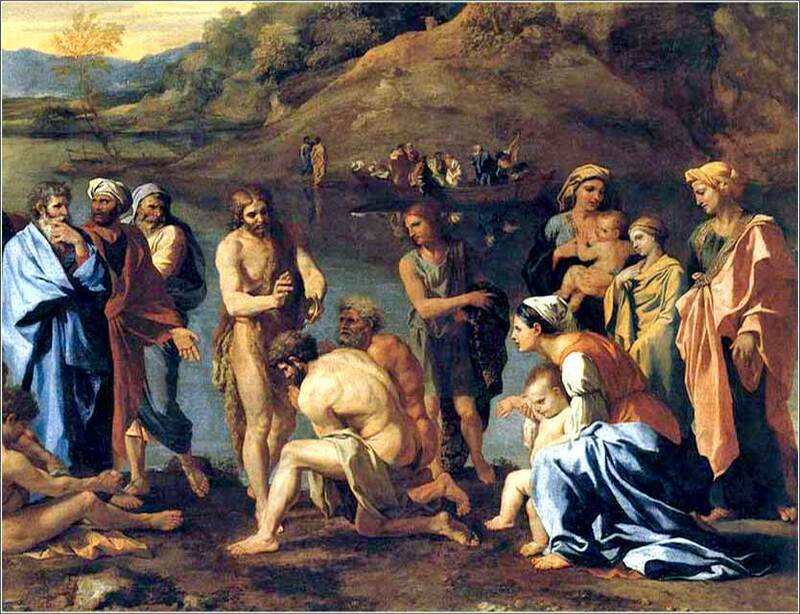 John the Baptist Baptizes the People (detail), Nicholas Poussin ca. 1635. An outstanding performance of the “Benedictus” from Beethoven’s Missa Solemnis (Solemn Mass), by Leonard Bernstein and the Bavarian Radio Symphony Orchestra in 1978, as part of the Amnesty International Concert. From the traditional (Catholic) Latin Mass. 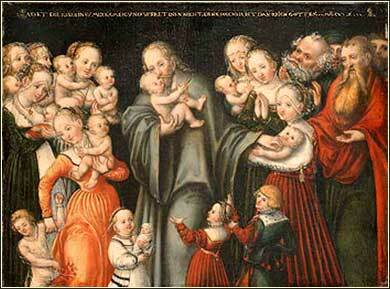 Christ Blessing the Children by Lucas Cranach the Elder, ca. 1545. We gain strength, and courage, and confidence by each experience in which we really stop to look fear in the face...we must do that which we think we cannot. Matthew's themes of Christ the King and Christ as the fulfillment of the prophets are combined in John the Baptist's proclamation, that Christ is the fulfillment of the prophecy of a coming king. John preaches that Kingdom of Heaven is about to arrive; but what does this mean, exactly? The concept of “Christ the King” can sound a little artificial, until we fully appreciate that it is (at least in part) a metaphor or analogy. Christ would not become a king in the general sense of the word: to call him “king” redefines the word. He did not sit as the supreme political ruler over a temporal land and its inhabitants. He did not make laws to be enforced by policemen or soldiers, collect taxes, wear a crown of gold and jewels, or equip an army with swords to compel obedience by threat of physical violence or death. Instead, he transcended the kings of earth and turned the notion of royalty upside-down. Instead of ruling by killing, he ruled by dying; he transcended death, the ultimate foundation of political power. His crown was thorns and his throne, a cross. He and his “court” were at the bottom of the earthly hierarchy: poor, humble, and victimized. Today, we would call this a “paradigm shift”. Instead of playing the game, he changed it. And so his herald, John the Baptist, did not come with trumpets and men in fine regalia; he came in utter poverty, living in an uninhabited scrubland, wearing the cheapest, coarsest clothes, eating like a survivalist. The sentence demanding that paths be made straight is a perfect illustration of this. When a great Eastern ruler made a journey, he would send hundreds or thousands of slaves ahead of him, smoothing and straightening the road. Obviously, people were not pulling up rocks and smoothing pavements for a carpenter from Nazareth. Jesus would walk on primitive paths filled with rocks and brambles, like the humblest commoner. Preparing a road for a monarch is an analogy for penitence; the rocks in the road to salvation are sinful acts, and the crooks and bends in the road, attitudes that veer away from love of God. John did not want his listeners to make a pretty road for Jesus. He wanted them to clear their hearts and souls and straighten out their lives, that they might be prepared for the gospel. Christ the so-called “king” will rule the realm of spirit, the souls of every human being on earth. What was considered important — the wealth and great struggles for power in the world of kings — he will trivialize into nothingness, and prove to be mere vanity.